This short article is in need of work. You can help Sonic Retro by adding to it. 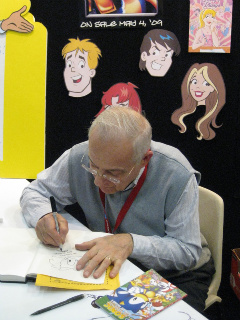 Jon D'Agostino (also known as John D'Agostino and Matt Bakerino), born June 13, 1929, is a former American comic-book artist best known for his Archie Comics work. Under the pseudonyms Johnny Dee and possibly John Duffy and John Duffi, he was the letterer for the Marvel Comics landmarks The Amazing Spider-Man #1-3 (March-July 1963; lead story only in #2). He worked as an early artist for the Sonic the Hedgehog Archie comics. This page was last edited on 18 July 2014, at 20:36.